The last time the Scottish Ballet performed in Seoul was in 1992 as part of the cultural entourage accompanying Prince Charles and Princess Diana. After more than a quarter of century, Scottish Ballet, led by artistic director Christopher Hampson, will perform its adaptation of the Brothers Grimm tale “Hansel and Gretel” at the LG Arts Center from May 23 to May 27. The Glasgow-based ballet company’s “Hansel and Gretel,” which premiered in 2013, is a rework of German composer Engelbert Humperdinck’s opera of the same title. The adaptation of the Brothers Grimm tale was Hampson’s first production at the company after taking up the post of the artistic director in 2012. 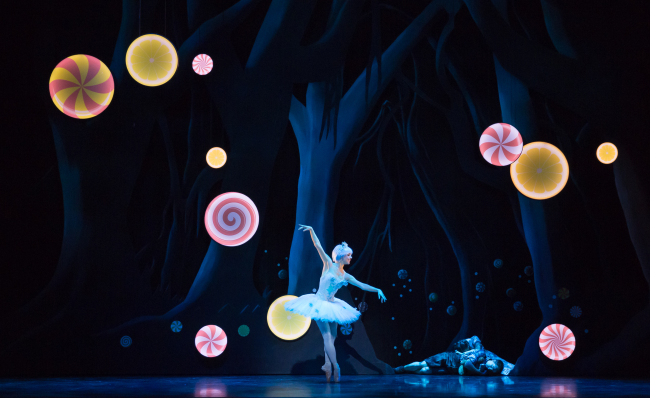 Hampson’s choreography and Gary Harris’s colorful set create a “Hansel and Gretel” that is a charmingly refreshed version of the classical fairy tale. Compared to the original storyline by the Brothers Grimm, Hampson’s is rather more delightful and adventurous. Children have vanished from the village, except for Hansel and Gretel. Their parents keep the children at home to protect them from harm, but the two, bored out of their wits, decide to make an escape, embarking on an adventure into the magic forest to find their missing friends. “Although the (original) story is well known, it is quite slow moving and the beginning is especially dark with the parents wanting to lose their children in the forest. For our version, I wanted to make Hansel and Gretel more adventurous, and their parents be loving and kind. A major difference in our version is the Witch is in the story right from the beginning,” Hampson commented on his adoption of the old story, in an interview conducted by LG Arts Center. For the upcoming shows in Seoul, eight children dancers of the National Dance Company of Korea’s academy will be on stage with the internationally acclaimed ballet company. “We are very used to working with children. We love engaging with young dancers and sharing our productions with them. It’s important to get children involved with all aspects of theatre. Not all of them will become dancers, but hopefully they can appreciate the hard work, dedication and passion that goes into producing a performance,” said Hampson. The Scottish Ballet Orchestra, led by the head of music Richard Honner, will perform a new musical arrangement of Humperdinck’s original score. Established in 1959, Scottish Ballet is one of the four leading ballet companies in the United Kingdom, together with the Royal Ballet, English National Ballet, and Birmingham Royal Ballet. After the Seoul performances, Scottish Ballet will stage “Hansel and Gretel” at the grand theater of Hong Kong Cultural Center from July 6-8, as well as at the Macao Cultural Center from July 13-15.